German investment in the ten member states of the Association of Southeast Asian Nations (ASEAN) has been increasing steadily and has the potential to grow further in the coming years. In the first part of this five-part article, we analyzed German investment in Brunei and Cambodia, and in the second part, we covered Indonesia and Laos. We next look at Malaysia and Myanmar. Ranked 28 on the Market Potential Index 2018, Malaysia represents a fast-growing market with a huge potential for German products. 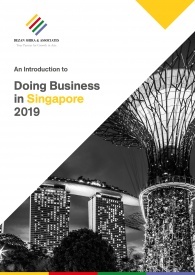 The country is also ranked 15 on the World Bank’s Ease of Doing Business Index 2018. Known for its excellent track record in the areas of protection of minority investors and issuance of construction permits, Malaysia has remained an attractive investment destination within ASEAN for German companies, who have invested a total of US$ 481 million in the country in 2017. 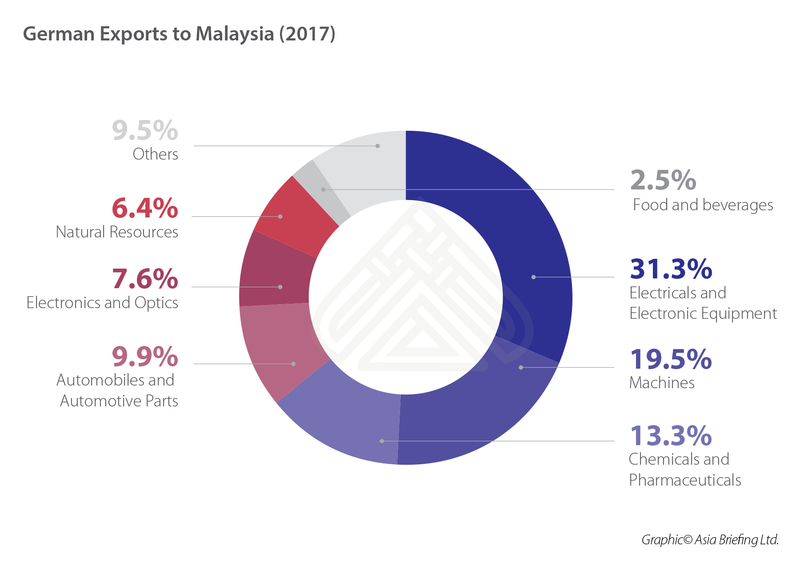 Goods worth around US$6.11 billion were exported from Germany to Malaysia in 2018. The export numbers were largely consistent in recent years. On the other hand, Germany imported US$10.6 billion worth of goods from Malaysia in 2018, which was a steady increase compared to the preceding years. Imports mainly consist of electronics, electrical and electronic equipment. Several German companies have already established business operations in Malaysia, including Siemens, Audi, BMW and MAN. Malaysia is especially attractive for companies from Bavaria, one of the main high-tech producing areas in Germany. 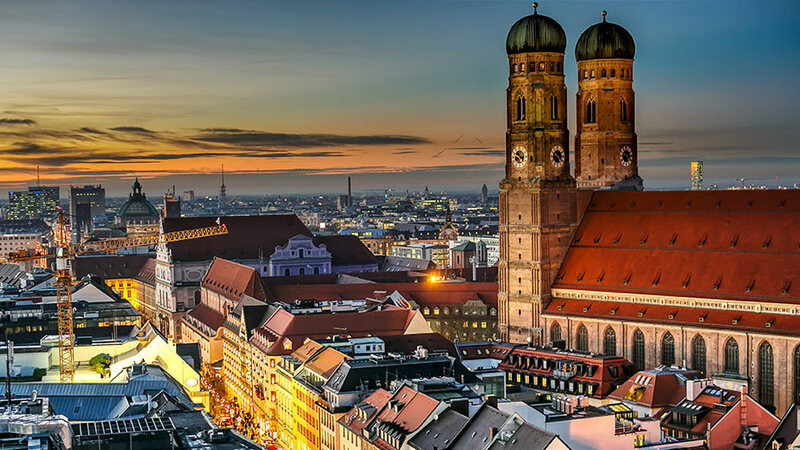 Recently the Bavarian international business promotion organisation has signed a MoU for the improvement of high-tech collaboration between the two regions. Malaysia with its strategic location, access to the ASEAN market and a desire for future technologies represents an attractive destination for German tech companies. With a consistent annual growth rate of close to 4.5 percent and the easy market entry conditions, Malaysia represents a perfect opportunity for German business operations. Malaysia continues to implement programs for the improvement of the skills of the country’s workforce with the objective of having 45 percent skilled workers by 2030. In particular, in regard of its aspirations for industry 4.0, various skill development programs are in place. Malaysia is highly dependent on imports for medical equipment. This opens vast opportunities for German companies to export to Malaysia, to build up factories or contribute the machines for independent production. The aspirations of the Malaysian government to become a regional medical tourism hub plays to the advantage of German exporters to export or settle down in Malaysia. Smart manufacturing or Industry 4.0 is increasingly popular in Malaysia. As Germany has led its development in Europe, Malaysia highly welcomes German investments in this sector to help the country to become a regional high-technology hub. An exchange program ‘Malaysian Engineers – Made in Germany’ provides young local engineers the chance to get insight into German technologies and then help building up facilities in Malaysia. Especially, the German machine construction industry can highly benefit from this increasing demand for imports. There are also increased opportunities in the chemical industry, which expects further growth. In particular, pharma, consumer goods and products for the construction industry will experience high growth rates due to increasing demands. In the energy sector, the government focuses on diversification and aims at increasing the share of renewable energies of the total energy product from 2 to 20 percent (without water power) by 2020. This opens up vast opportunities for German companies as most of the knowledge, facilities and investment in these operations comes from abroad. The hub in Subang which was announced several years ago is going to be revived and is poised to become the largest regional aerospace hub. With recent demand of new investment opportunities, the government aims to implement the industrial park again. The government and private organizations want to develop the park into one of the biggest aviation service providers in the region. Situated strategically within ASEAN, one of the world’s fastest growing economic regions, the hub can be a supplier and repair station for several major economies. German high-tech firms that provide several services for the aerospace industry can explore vast opportunities to get involved and to help build regional hubs. Labuan is a small island within Malaysia that offers a liberal tax regime and other incentives. 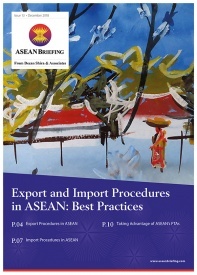 The advantageous of establishing a business easily as well as the comparable cheap prices are especially interesting for companies newly entering the ASEAN market. While Labuan is a part of Malaysia and therefore ASEAN it offers perfect possibilities for offshore companies to establish regional offices as they have access to the ASEAN market. At the same time, it offers low prices in comparison to Singapore which is the current main hub for offshore companies to establish offices within the region. Malaysia has in the recent years has introduced several investment projects especially with the help of China. From high-speed railways to an entirely newly established city called “Forest City”, large parts of these projects were investigated and stopped by the government as they exceeded the government’s budget which faced several problems recently. Especially regarding the aspirations in industry 4.0 and high-tech industry, Malaysia has several challenges to manage. First, the skill level of workers needs to be increased to keep up with the demand of international and local high-tech companies. Second, the close proximity to Singapore, which is already a high-tech hub, could potentially be a problem as several German companies have their high-tech branches there and see no incentive to move to Malaysia. With enhancing growing economy in recent years, Myanmar represents a market with vast investment potential for German companies. With steady FDI inflows in recent years, a strategic location between China and India and within ASEAN, Myanmar serves as an attractive investment destination. In 2018, Germany exported goods worth US$144.5 million, though exports have been declining in recent years. On the other side, German imports increased to US$1 billion in 2018, which is a significant improvement on previous years. German imports from Myanmar are largely focused on textiles and footwear. So far not many German companies have ventured into the Myanmar market. In recent times, energy and infrastructure projects have especially caught the attention of German companies that want to invest in Myanmar and aim to expand their business. With the recent opening of Myanmar, the ways to get involved expand quickly. 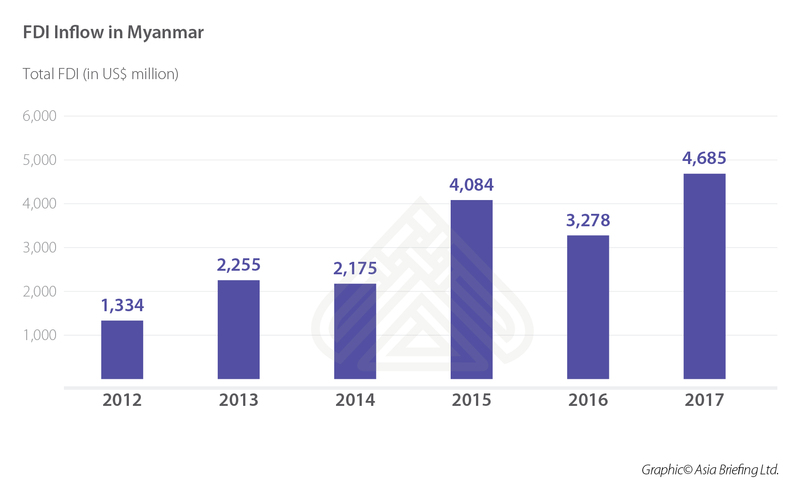 With growth rates of over 6 percent in the recent years and government measures to open up the economy, Myanmar becomes increasingly interesting for investors. The reforms in the banking sector and liberalization of market access for foreign banks make investments in the local economy more attractive. The food and beverages sector contributes two thirds to the total goods production in Myanmar. International brands have already viewed the large investment opportunities and moved production facilities to Myanmar or plans to establish new ones. Germany with a strong machine industry can position itself here as an important facilitator. Since the end of sanctions on the textile industry in Europe and the US the sector experienced expansion to three times the exports in the last five years. As shown above, the majority of exports are textiles. About 400 factories are involved in the sector, of which 171 are entirely foreign-owned. Further, opening of bids for oil and gas exploration is announced for 2019. 18 onshore and 12 offshore blocks will be offered. German tech-companies can especially offer services as supply companies for machines and high-tech equipment. The renewable energy sector also offers opportunities for German investors. Solar and wind power play a major role in future development and for potential involvement of German corporations for providing knowledge and high-tech equipment. The common border with China and China’s large infrastructure plans under the Belt and Road initiative opens up further possibilities. With low wages, Myanmar is attractive for companies that are considering moving from China to another country while still supplying the Chinese market. 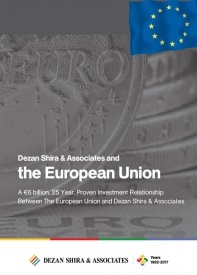 Special Economic Zones are already in the planning and under construction. The National Logistics Master Plan aims at connecting Myanmar with the surrounding countries and to develop economic exchange while increasing the competitiveness of Myanmar as a manufacturing hub. The Plan connects China and India in the North with the economic centres in Yangon and Mandalay and further the Southern Economic Corridor. 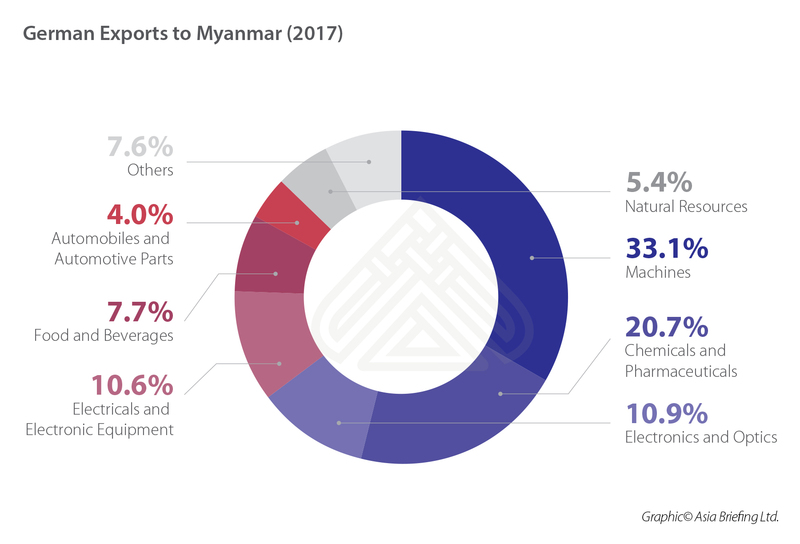 This further connects Myanmar with Thailand and Cambodia and opens up vast possibilities for manufacturers to establish supply firms in Myanmar that produces products for factories in Thailand. Myanmar opens up vast opportunities but at the same time holds a lot of risks as well. First, the number of skilled workers is low and does not allow complex manufacturing activities in the country. The government recently opened up the local education market especially for foreign education provider. The major influence of China that represents the grand majority of all FDI could also display a potential risk factor. China’s control of the infrastructure projects especially in the north could also have adverse effects. In the fourth part of this five-part article, we will look at German FDI in the Philippines and Singapore.